T. Thorn Coyle is a magic worker and Pagan committed to love, liberation, and justice. This started out as an interview, but Thorn was so fascinating to talk to, and such a good listener it turned into a discussion. 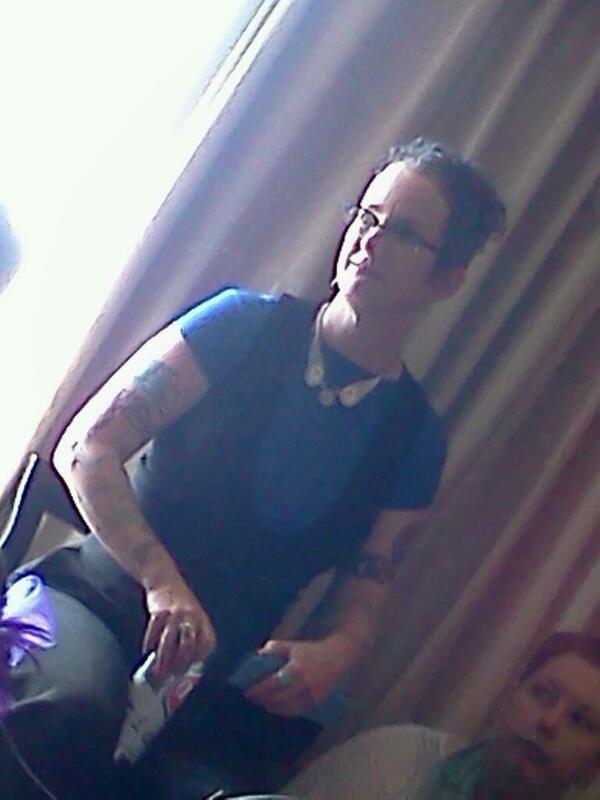 We talked at Heartland Pagan Festival. How have you, your community in Oakland and local Pagans responded to the Black Lives Matter movement? The San Francisco Bay area where I live is pretty racially diverse, though San Francisco itself is growing less and less diverse each year. The more white money that comes in the more people are pushed out and that’s now effecting the East Bay where I live. I do a lot of work in Oakland and Berkeley. Oakland has more traditionally African American and Berkeley is a university town. In the Pagan community, a lot of us have been out on the streets working with various grassroots community groups trying to get local change. I’ve been an activist most of my life, and have been engaged with police violence and brutality issues since 2012. I first became aware of this issue on a deeper level when Oscar Grant was killed. He was clearly unarmed, and it was caught on videotape. Oscar was handcuffed on the ground and a cop shot him in the back of the head. That really put the issue in my mind. That was in 2010. In 2012 another young man, Alan Buford, was killed by police. Something about that case struck me. I recall distinctly when I heard his family speak. It was my day to volunteer at the soup kitchen and I was heading back home to a spiritual direction client. I had another meeting later on, too, but there was a city council meeting at 6pm and knew Alan’s parents were going to speak. I knew I had to be there. Hearing Alan’s mother Jeralynn speak changed my life. It was one of those moments, and I became committed to the struggle. I started doing a lot more work locally around issues of police brutality, including organizing around “Urban Shield” which is a conference that ostensibly trains first responders for disaster relief. What it really does is trains first responders in crowd control, and gives them military training. Their big vending show is all military weaponry. Urban Shield is basically about the militarization of our police. That was a lot of work I was doing. The highlight reel that Urban Shield itself puts out is pretty horrifying for me as a citizen. It looks like war games to me. I’d been doing some of that community work and then Ferguson hit. I thought, “Oh my gosh those young people in Ferguson, they’re not going home.” They started a movement for which I am grateful. 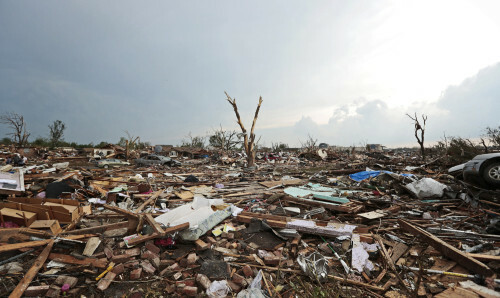 MOORE, OK – MAY 20: Debris covers the ground after a powerful tornado ripped through the area on May 20, 2013 in Moore, Oklahoma. Pagans are doing what they can to assist the victims of the recent Oklahoma EF-5 tornado and Solar Cross, a group devoted to service and education for Pagans, is soliciting donations for relief efforts. Solar Cross is working directly with Marcia Carter Tillison, a Pagan in Norman OK, and with OpOK, a consortium of Occupy, Food Not Bombs and other activist groups working together to get supplies and help with on the ground clean up efforts in Moore. Ms. Tillison has on the ground experience in disaster relief in Haiti. 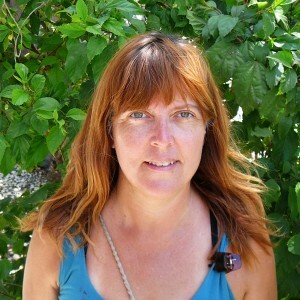 Pagan author T Thorn Coyle, who has lead workshops in the Twin Cities, is spearheading the fundraising drive for Solar Cross. More donations are needed. Continued storms and hail pelt the devastated region, hampering relief efforts and destroying what little possessions people have left. OpOK says there are over 13,000 homes, a school, and a hospital affected and they are working to help people that are falling through the gaps. The fundraising effort by Solar Cross help provide supplies such as garbage bags, rakes, shovels, gloves, duct tape, tarps, and heavy duty storage bins. Donations can be made via paypal to solarcrosstemple@gmail.com with the subject line marked “Tornado Relief”. One of the most talked about educational sessions at Pantheacon, a conference for Pagans, Heathens, Indigenous Non-European religions hosted in San Jose, California each President’s Day weekend, wasn’t part of the official programming. It was the Pagans and Privilege panel which explored the layers and effects of privilege within our religious community. Panel members included Elena Rose, Xochiquetzal Duti Odinsdottir, River Higginbotham and past Sacred Harvest Festival guest of honor Crystal Blanton. Ms. Blanton and her family continued to attend Sacred Harvest Festival since her first introduction to the festival even though they live in California. 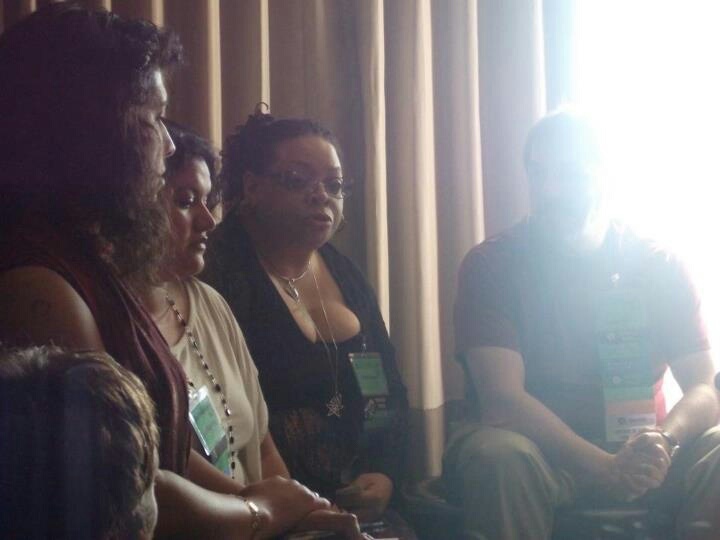 The panel was moderated by T. Thorn Coyle, who has held workshops in the Twin Cities and across the USA. The Pagans and Privilege proposal was originally submitted to Pantheacon to be part of the official programming, but like many other proposals, didn’t make the cut. Covenant of the Goddess, New Wiccan Church and the New Reformed Order of the Golden Dawn shared the Presidential Suite, a large multi room con suite, and they offered the group space for the workshop. News of the panel spread through social media. And spread. Ms. Besnett, like an estimated 25 others, wasn’t able to attend the panel because the room was already packed. “When people started sitting on the floor to make room, I got the idea that this might be a heavily attended program,’ said Blanton, “then I started wishing we had more space and more time.” Forty two people wedged into the single room. The panel opened with Coyle talking about what is meant by privilege. “If you have clean drinking water coming out of your faucet, that is privilege.” She emphasized the discussion about privilege would not be about placing blame, guilt, or victimization but about gaining a deeper understanding of one another and exploring differences and common ground. Privilege is often defined as the advantages a person or group has that are so normal to them they are usually unaware of them. Ms. Odinsdottir had advice for those who sit at the pinnacle of privilege in the United States, “Don’t apologize for things you didn’t do, don’t say you’re sorry for what others have done.” She told attendees that misplaced guilt is not helpful, but being aware we live in a white supremacist culture is. Some of the attendees leaned back or looked confused or unhappy at her statement. She explained a white supremacist culture has nothing to do with being a skinhead, it is simply a culture where white culture is supreme and in a position of power. Mr. Higginbotham joked about his position of privilege saying he’s a white male with a good income. Like the other panelists he echoed times in his life where he has unthinkingly enjoyed the benefits of privilege and how difficult it is when that privilege is yanked away from him. He spoke about how, due to his religion, he’s had a deep concern he could lose his job. The hour long discussion was paced by Coyle who asked the audience and panel to stop and take a deep, slow breath. These breath breaks were designed to allow participants and attendees to maintain control over powerful emotions and to let meaning sink in. Towards the end of the discussion, Coyle invited attendees to continue the discussion at the Pagans Of Color hospitality suite, as their allotted time was almost up. “At 6:25 pm (April 25th) the Executive Director dissolved the board of directors,” reads the last entry in the minutes of the final board meeting of Sacred Paths Center, a Pagan community center in Minnesota. A few days later, on Beltane, Executive Director Teisha Magee sent out an email saying the center closes May 31st. 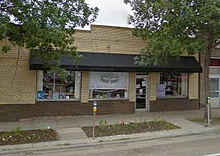 “Why is Sacred Paths Center closing?” is a question asked by Twin Cities Pagans after reading the announcement. That question is quickly followed by, “What can we learn from their experience?” by Pagan organizations such as Solar Cross Temple in San Francisco and the Open Hearth Foundation community center in Washington DC. PNC-Minnesota spoke with past and present Sacred Paths Center (SPC) board members, volunteers, and their last financial auditor, looked over financial records and minutes of board meetings, and interviewed Teisha Magee to answer those questions. In short, most everyone interviewed says the center’s Director and Board were not functional, the finances were in disarray, the building was too expensive, and the resulting drop in income after two years of road construction right outside their door didn’t help matters. Despite that, they are united in saying the center almost made it due to the efforts of the Director, Board, volunteers and the most importantly, the community support. According to the U.S. Bureau of Labor Statistics only 66% of new businesses make it past two years and only 44% celebrate their fourth anniversary. Sacred Paths Center made it three years and three months. Popular author, musician, and speaker T Thorn Coyle is traveling the continent signing copies of her most recent book, Kissing the Limitless, giving talks and teaching workshops. This weekend, she comes to the Twin Cities. PNC-Minnesota caught up with this busy and dynamic mystic to talk about her Paganistan weekend. PNC-Minnesota: How did it happen that you are coming to the Twin Cities for the workshop and book signing? T Thorn Coyle: The Twin Cities are home to many people who have studied with me over the years, or whom I’ve worked magic with in various ways. The thriving community in the area has always been very welcoming to me and I’ve been coming here off and on since my first book “Evolutionary Witchcraft” was published. Last time I was out, I taught at Sacred Paths Center in St. Paul, and gave a talk at Eye of Horus. At the time, Jane expressed interest in having me back out to teach at Eye of Horus itself. PNC-Minnesota: I know you’ve been very busy traveling lately, but will you be able to sightsee while in the Twin Cities? Going to any of our Sacred Spots, visiting the Celtic temple, or the Pagan Community Center?